Wow, what a day. I had a day with no teaching, but…. Met with the tutors and have engaged Anna Grace, one of the tutors, to work with us on the WHO checklist. We have a plan, some enthusiasm and a full training session being planned over dinner with surgeons, tutors and midwives next week. I hope it is going to be that easy!! 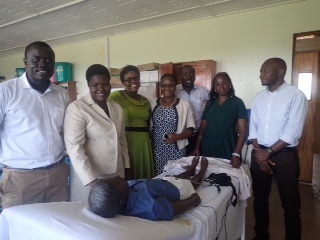 Also met with a team from Mbara who are showing the tutors how to use the clever Laerdal simulators. Sim Junior comes in black!! But with a $25,000 price tag, they will not be getting one soon. 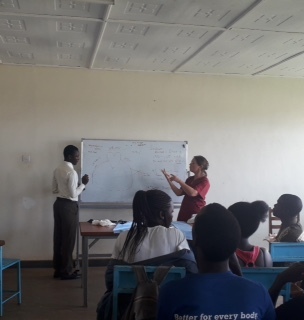 Finally met with a group of 4 girls from Scandinavia, will find out more about them when we meet again, but they are in Lira for 3 months, on their own budget, to look into teenage pregnancy and write a project. Bournemouth University need to think quick about joining Lira University before it is too late. 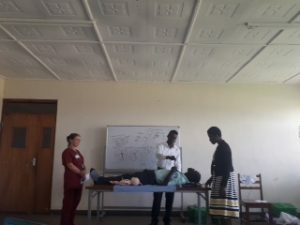 Judy and Edwina were teaching together, not sure who was most exhausted, the students or the trainers, but there was plenty of laughter, so I am sure they have learned about the fundamentals of nursing, including shock, ABC assessment, and scenarios. Eva and Julie went to the hospital to put the world to rights. Eva can say things to her fellow countrymen, that none of us would dare to say. We are really enjoying her contribution to the project. The labour ward was running more smoothly than we have seen before, safe in the hands of one of our recently qualified midwives from Lira! Really exciting to see them taking responsibility and being effective. 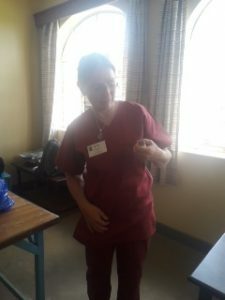 However, Julie had a challenging neonatal resuscitation following a CSection for prolonged labour. The baby was born with no heart beat or respiration. After 10 minutes of her excellent efforts the baby went to NICU breathing spontaneously. We are now crossing our fingers. Judy also saved a life, plucking a baby bird out of her toilet and setting it free! !